Expecting a radical shift under a new president is misguided. For the past two years, several governments, corporations, and academics from across the Asia-Pacific region have repeatedly asked me about a single issue: Whether the departure of President Benigno Aquino could usher in a new type of bilateral relationship with China. In the coming months, the Philippines will enter the election season, and as candidates from varying political persuasions jostle for the top office, such speculative question will gain more currency. Some people have even suggested that the Aquino administration should be primarily blamed for the sorry state of bilateral relations with Beijing, notwithstanding the strategic implications of China’s aggressive pursuit of its territorial claims in the South China Sea. Even in the Philippines, where majority (57% in one survey) of the population holds favorable views towards the incumbent leader, some sensationalist columnists have gone so far as outrageously claiming that Aquino is to be entirely blamed for China’s massive reclamation activities and growing assertiveness across the Western Pacific. I won’t be surprised if the leadership in Beijing is simply waiting for a new government in Manila before exploring the possibility for more substantive dialogue. Indeed, one can sense that China is waiting for someone it thinks it can deal with, and they have simply concluded that Aquino is not that person. However, a more careful look at the Philippines’ domestic politics shows how the succeeding administration will have limited room for maneuver vis-à-vis China unless the more powerful party makes some genuine compromises (a farfetched prospect). To be seen as tough on China is simply good domestic politics, especially for populist Filipino leaders. And to do the opposite would surely risk massive political backlash. One of the most interesting aspects of Aquino’s leadership is its constant emphasis on moralizing in a realm which many see as amoral: state affairs. As the son of the two of the most revered political figures in modern Philippine history, he never shied away from portraying his foray into politics as a moral endeavor to redeem a fallen nation, ridding the country of corruption and reforming state institutions. From the very beginning, Aquino launched what in many ways look like a moral crusade against his predecessor, Gloria Macapagal-Arroyo, and her holdovers in the government. His “good governance” (Matuwid na Daan) looks more like a moral vision for an ethical nation than a 21st century strategy aimed at enhancing governance structures in an emerging market. In many ways, Aquino reverted to the pre-Machiavellian understanding of politics, where leadership and morality are inseparable. For Aquino, the end doesn’t justify the means; or, at least, is how he has sought to portray his branch of leadership. Astonishingly, Aquino extended his moralpolitik to the realm of foreign affairs, where he began, particularly since 2012, to frame the Philippines’ territorial standoff with China as a David vs. Goliath battle, where right triumphs over might. Viewing politics through the prism of morality, the Aquino administration has heavily invested in its inherently uncertain legal battle against China. 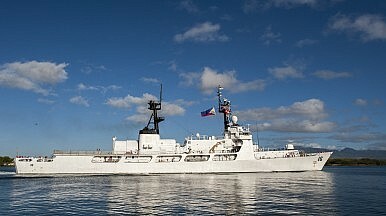 It is an approach that fuels the Philippines’ sense of righteousness, but may not necessarily facilitate the resolution of the maritime disputes in the South China Sea. The Aquino administration has even prevaricated on joining the China-led Asian Infrastructure Investment Bank (AIIB) and welcoming any major Chinese investments in the country. Today, the Philippines is one of the fewcountries in the region that doesn’t count China as its top trading partner. Earlier this year, Malcom Cook, a Southeast Asia expert, went so far as to claim that the “2016 Philippines presidential election looks like it could lead to a sharp change” in Philippines’ policy towards China. After all, Philippine-China relations enjoyed a brief honeymoon during the Arroyo administration, while one of the leading 2016 presidential candidates – who is now rapidly losing support among voters – has repeatedly expressed his preference for a more pragmatic approach to China. Though more Filipinos are now skeptical of Aquino’s China policy, to think that his departure from power will radically change the Philippines’ foreign policy is misguided. First of all, in the past, especially during the Arroyo administration, there was a very limited public awareness vis-à-vis the territorial disputes in the South China Sea, thereby creating space for striking difficult deals with limited outside scrutiny. Today, in contrast, the maritime disputes with China constantly attract public attention, with leading media practitioners, academics, and even civil society groups relentlessly mobilizing their resources for a minute-by-minute analysis of how the Philippine government is standing up to China. Moreover, China’s aggressive behavior, particularly its coercive occupation of the Scarborough Shoal in mid-2012 and its massive reclamation activities across Spratly chain of islands in recent months, has rekindled age-old prejudice against Communism, China, and even people of Chinese background. Majority of the Filipinos see China as a threat, with as many 93% worried about prospects of war in the South China Sea. The Aquino administration’s combative language against China hasn’t helped either. Today, to even talk about engagement with China is seen as defeatist by many Filipinos. The Arroyo administration, which entered into a highly secretive and controversial joint development agreement with China that went along with corruption-ridden business deals soon after, managed to leave a very negative impression among Filipino people, who sometimes view diplomacy as a euphemism for surrender to China. No wonder then, there isn’t much hand-wringing among Manila’s top allies in Washington and Tokyo. To put it bluntly, I don’t think the next Filipino administration will change the country’s China policy in any significant way. The author is an assistant professor in political science at De La Salle University, and a former policy adviser at the Philippine House of Representatives (2009-2015). He is the author of “Asia’s New Battlefield: US, China, and the Struggle for the Western Pacific” (London ,2015). We need to fully grasp the significance of the Philippines v. China verdict.